Many thanks to Rob who has invited me to contribute to this blog. Last week Jürgen Habermas visited Ireland and received a prize from University College Dublin, where I teach philosophy to adult classes. 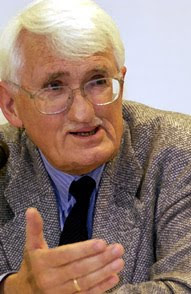 Habermas is considered the most important European living philosopher and belongs to the second generation of the 'Frankfurt School'. This is a group of philosophers and sociologist based in Frankfurt who, in the middle of last century, presented a criticism of capitalism (but also of Soviet socialism) often called 'critical theory'. It was an attempt to update the thought of Karl Marx taking inspiration from psychoanalysis and sociology. Habermas philosophy is a ongoing response to the first generation of Frankfurt School theorists. In this short note I want to concentrate on a particular idea that Habermas, who is now 81, has presented in the last years. He maintains that in the past it was commonly accepted that modernity and secularization proceed together. The more a nation embraces the principles of democracy, rights and participation, the more it becomes secular in the sense that religious ideas have less relevance in the public life. The core of the process of secularization is the separation of church and state. Habermas, who is a secular thinker, doesn't deny the importance of this separation but criticises the assumption that history goes necessarily in that direction and religion is destined to become irrelevant in the public square. He shows that if religion has lost its traditional power in Europe, especially in terms of its ability to have a strong influence on the masses, this is not always the case in other modern western societies such as the United States and it is even less the case in the non-western world. We witness an on-growing role of religions on the world scale, a role that was not expected by theorists of the previous generation. They considered religion as a configuration of the past, which was destined to become more and more irrelevant. But Habermas reckons the continuing existence and relevance of religious traditions even in societies which are largely secularised. Europe seems to be the exception rather than the norm in this apparent coincidence of modernisation and secularisation but what will the future be like? It seems that also in Europe things are going in unexpected directions. Journalist: I used the expression “post-secular” to describe a shift in public consciousness in such predominantly secular countries as Canada, Australia, New Zealand or western Europe. Here the resurgence of religion that we are observing in other global regions has unsettled a dominant but unspoken presumption. In these countries it is no longer a cultural commonplace that religion is outdated, that it is destined to disappear with the advance of modernisation. All are now coming to the realisation that religious communities are destined to remain with us, even as the surrounding environment becomes increasingly secular. Habermas: I associate this sociological observation with a diagnosis of a more philosophical kind. Secularly minded people should recognise religion as a contemporary intellectual formation. Over the past two millennia, western philosophy has repeatedly borrowed images, meanings and concepts from the Judaeo-Christian tradition and has translated them into its own secular language. We cannot tell whether this process of appropriation has run its course or whether, on the contrary, other semantic potentials remain untapped. Of course, such a receptive and dialogical relation is only possible towards non-fundamentalist traditions that do not close themselves off from the modern world. The issue that Habermas may be overlooking is that the on going religious influence in some industrialized and industrializing countries is not a sign of their improved civility, and is in fact contrary to it. One of the marked characteristics of religiosity is its propensity toward violent acts of self preservation and proliferation. In so far as the religious are more willing to use coercion, they are more successful at reproducing themselves throughout societies and cultures in an evolutionary way. The problem is that where they are most successful, they do have a tendency to halt or even undo the progress that is made by secular institutions and people. Where he says "Secularly minded people should recognise religion as a contemporary intellectual formation," I think he may simply be mistaking an apparent contemporary resurgence or intransigence of religious attitudes as their having acquired a certain level of intellectual fortitude, but that does not appear to be the case. People do not hold religious beliefs for any greater intellectual reasons than they did millennia ago, rather they retain them for the same savage reasons that these beliefs were promulgated the world over. The modern secularist needn't carry on the appropriation of religious symbols and concepts, and it may be argued we should reject them until they lose their ontological force for the majority of individuals, and can therefore be safely re-appropriated in the same way that christians re-appropriated meaning from earlier polytheistic religious iconography. Polytheistic religions in the west did not dissolve because they lost their ability to persuade people through reason, they were violently over thrown. Though I do not advocate violence in response to contemporary religion, we must be deliberate and adamant in our excoriation of it, and wary of its potential violence against us. Not until we have removed the threat of this violence, necessitated by the ontological certainty of claimed by religious believers, can we then safely say that contemporary religious expressions are consistent with modernity. Instead it seems that they in fact threaten modernity at its very core, and more so now than ever since the enlightenment. Shouldn't the principle of laicism, including the freedom to practice one's religion or not, and the tolerance of allowing others to practice theirs, be considered as a mature, civilised response in modern democracies regarding this question? If the increase in Muslim radicalism encourages Europeans to return to what they might consider their 'religious roots', this would be more reactionary than a sincere religious inclination. One could also reason that any form of religious radicalisation is a form of defence, and that no real religion should ever need to be demonstratively defended. In this respect Thomas More's views on religion in 'Utopia' are still perfectly valid, and he, a devout Catholic, paid the ultimate price in defence of his own integrity. The term itself 'religious roots' is not always easy to define in a positive way when referring to European history in any case, unless one cancels out centuries of religious intolerance and religious support of monarchial absolutism. I think that by making such distinction between secular and secularist many misunderstandings can be avoided. A secular person is someone whom a believer can actually and fruitfully talk to—I mean, the dialogue between the two can be reciprocally useful. On the contrary, no true and authentic dialogue is possible between believers and secularists. I thoroughly agree with Habermas' approach to the issue of secularism, included his distinction between "secular" and "secularist" (Rob is absolutely right: this is actually a very meaningful detail), which, in turn, is rooted in the difference between the English and Scottish enlightenments, on the one hand, and the French enlightenment on the other. See for instance Gertrude Himmelfarb's book "Three Roads to Modernity." The English and Scottish enlightenments were in some sense in continuity with the Christian history of the West, although they grew out of contentions within the Christian history of the West, and gave birth in 1688 and 1776 to new political forms and experiences that were not self-consciously over against that which came before but understood themselves as refinements—perfections, if you will—attempts at perfecting what had come before. While Seventeen eighty-nine was a product of the French enlightenment that was quite different, that consciously understood itself to be over against the Ancien regime in all of its forms, but particularly its religious form and particularly the enormous role of the church in state affairs.